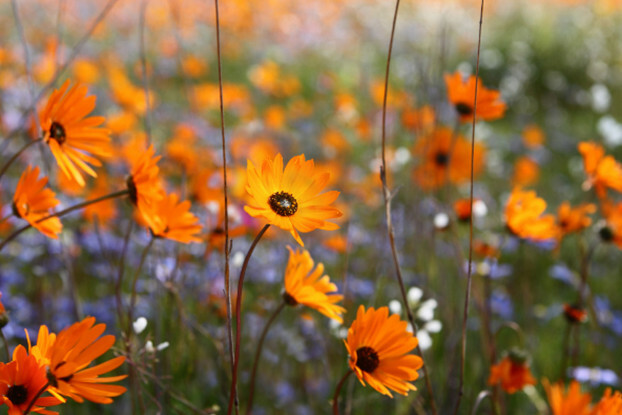 African Daisy is a low growing, showy annual native to southern Africa. As a member of the daisy family, its flowers resemble the classic daisy shape. It blooms from spring to summer in brilliant yellow, orange, and white. It grows up to 16 inches tall and prefers full sun and well-drained, gritty soils. African Daisy is considered drought tolerant. It is recommended for ground covers, borders, or areas where quick cover is needed. If it’s allowed to reseed it will return year after year.